Lyceum International School Wattala clinched the boys’ and girls’ Under 15 badminton championships, at the 2013 Inter International Schools badminton tournament, worked off in Colombo recently. The champion boys’ team was captained by Pranavan Sudhahar, while the champion girls’ team was led by Keerthika Logeshwaran. In addition Pranavan Sudhhar was selected as the Player of the Tournament in the boys’ segment while Shavindri Perera was named Best Player in the girls’ category. The Lyceum girls’ and boys’ teams completely dominated the tournament and overcame all their opponents quite convincingly right until the final. 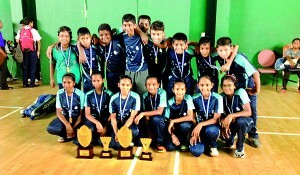 The champion Lyceum girls’ badminton team comprised of Keerthika Logeshwaran (Captain), Sachithma Edirisinghe, Dinuli Edirisinghe, Shavindri Perera, Manuki Chandrasekara, Nadeshi Kodippili, Theruni Galagedara The champion Lyceum boys team comprised of Pranavan Sudhahar (Captain), Santhush Thilekaratne, Prithvikash Prasad, Vikash Kannan, Tharin Perera, Ryan Perera, Nisalka Fernando, Kaveesha Muthukuda.